May 19 to 25 was declared as the MT Week for 2013. Maybe many of you are wondering, what MT stands for. MT stands for Medical Transcriptionist, a profession that is noble yet often overlooked by many. To begin with, a Medical Transcriptionist is a medical language specialist that puts into paper dictated reports by physicians regarding patient care. This is the simplest way to say a medical transcriptionist's job description. 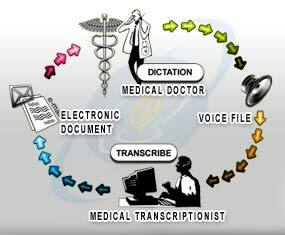 Medical Transcription involves medical terminology, typing, listening and a lot of common sense. It is just so frustrating when people say that an MT's job is easy as we sit in front of the computer eight hours a day and just type. Typing does not mean typing anything that comes out from the doctor's mouth. This means that before typing the report, the transcriptionists are already thinking if what the doctor said made sense and edit or flag it right away if it did not. Just imagine the big difference if the doctor said that, "the patient had a CABG" (pronounced as cabbage), which means coronary artery bypass graft and the medical report will show "cabbage" instead. It sounds funny I guess but when it comes to patient care, it is not. Medical reports should be as accurate as possible, as it would mean the life of a patient. In addition, there are a lot of doctors whose first language is not English, and of course part of an MT's job is to correct the doctor's grammar. I, myself, do not have perfect English as it is also my second language, but I can say that I speak and write better English than others who are also non-native speakers. I am a physical therapist by profession. However, as the opportunity for physical therapists in the Philippines was very scarce, I ended up being a Medical Transcriptionist and has been enjoying working as one for the last 14 years. Although I will soon bid my adieu to myself as a Medical Transcriptionist and will finally work as a Physical Therapist (I will tell you more about it on my future posts), I am and forever will be thankful for this profession that provided me shelter, food on my table, my own ride, knowledge that I have gained, and of course the opportunity to work with wonderful people of different nationalities who I now call friends. To the silent workers of hospitals out there, hats off to you.